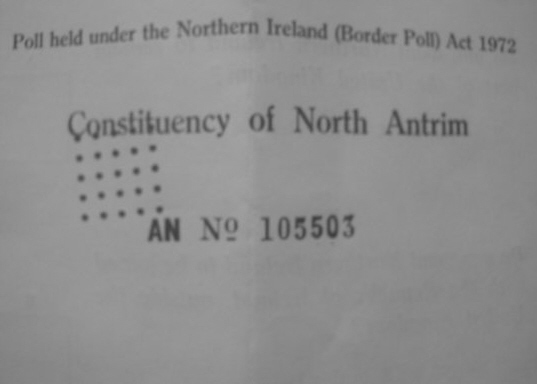 What a Christmas present to be sent by a kind reader…..
March the 9th 1973 a poll took place on the future of Northern Ireland. The Ballot below shows the choices. 591,280 people voted to stay part of the UK. 6,463 voted in favour of a United Ireland…. Nationalists were encouraged to boycott the poll, I can remember the graffiti for years after, ‘NO VOTE’ painted everywhere from derelict houses to trees….. 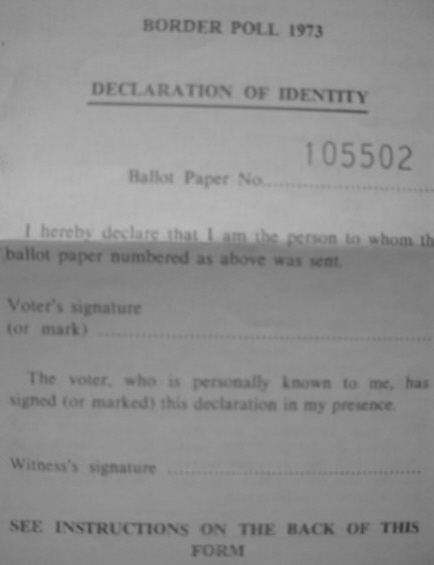 The images include the voting slip itself, the return envelope and declaration of identity which was a farcical document in the days of ‘vote early and vote often’. This has been a great and illuminating find of a site this year, Merry Christmas and looking forward to more of the same in 2010!